Salmon is one of the simplest and best tasting fish you can grill. 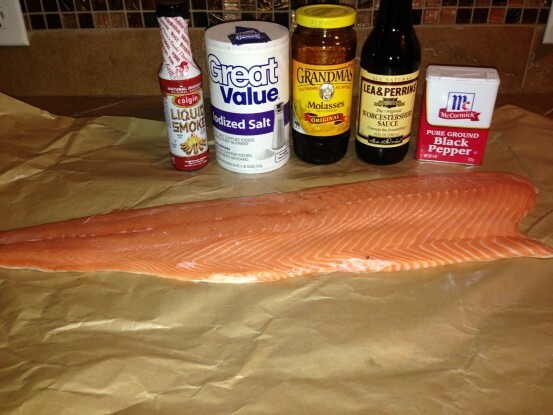 You probably already have the ingredients in your cabinet to do this grilled salmon recipe, so follow these easy steps and you'll have some great tasting fish that will have your friends and family begging for more. 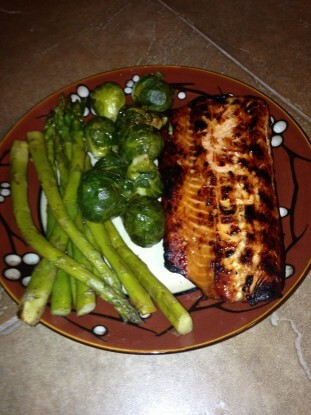 I love salmon because for me it's a meaty fish and so easy to cook. First pick out your fillet that best fit your size. When I'm cooking fish rule #1--cook too much! I love to eat fish so extra fish in the fridge is like finding morel mushrooms in the spring. The key for me to a great grilled fish is the brine with either grilling or smoking. Now if I were to smoke this fish I would make my brine a little saltier, but I'm grilling this one not smoking. 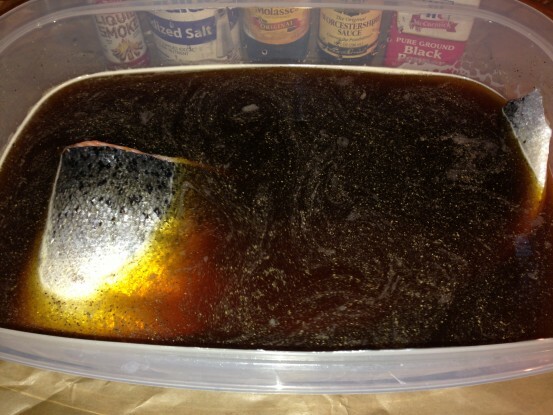 Think ahead and get the fish ready the day before so you can marinate it in the brine. Put the filet in the brine and be sure it's submerged completely, if not then make sure the skin side is up so the meat side is in the brine. Lets this marinate 12-24 hours if possible the longer the better. Let's skip to the outside and talk grill for a moment. There has always been a debate between what type of grill is best gas or charcoal. I'm the charcoal guy hands down. Yes, it takes a little longer to prepare but I'm willing to take the extra time to make it taste awesome. You can do this on a gas grill so don't stress. Most people who use charcoal never take the time to prepare the charcoal, yes I said prepare the charcoal. We've all done this, pile it in the middle, light it, burn it then sorta spread it. Well that works with steaks and burgers but not fish. Look at your fillet before spreading out the charcoal. If you have a long thick filet on one end and thin on the other? That's how your charcoal should look too. Deeper on one end and thinner on the other, just like your fillet. This technique will cook the fillet more evenly and no worries about a dry end and rare end, it cooks evenly. This only takes a second to prepare the charcoal, c'mon people we are the Master of Our Domain, do it right. Get the charcoal lit and burning. Oh and don't hurry on the charcoal remember it's fish it doesn't take long to grill so we have plenty of time. Now here's a few little extra things you can do to finish off this meal. Some people like tarter sauce with their fish but I like horseradish mixed with catsup. Yes, I know it's basically cocktail sauce but I like mine with a little more kick, 1 cup of catsup with 2-3 tablespoons of horseradish, mix to taste. One last thing that's easy to cook; you'll need a side dish so try this. Wrap some asparagus and brussel sprouts in some tin foil with 3tbs of butter, sea salt and some cracked pepper. This will go to the grill at the same time as this fish, this is normally on the top rack for my grill. Spray the grates just before you lay your fish on the grill; in some cases if my filet still has the skin, I'll spray it as well, lay the skin side down on the grate. Grill the salmon until the filet feels firm with the finger. This won't take long maybe 15 minutes depending how hot the charcoal is. 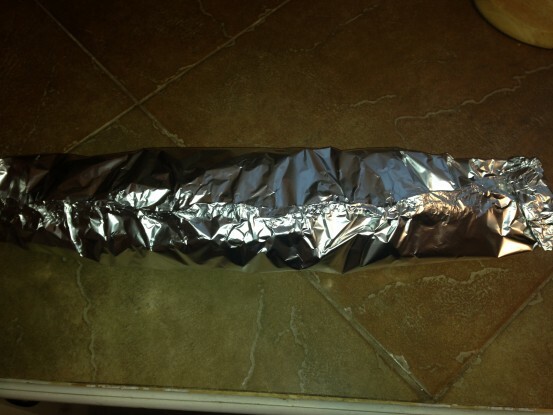 Once you think the salmon is done; wrap it in tinfoil when you take it off the grill, this will keep it moist until it's ready to eat and also finish cooking if you think it's not quite done. 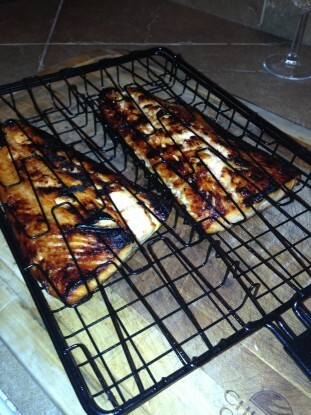 If you want to add a little smoke flavor; throw in a few wood chips just as you start to grill the fish. Make sure not to lay the chips directly under the filet in case it flares up, put it off to one end.